No matter how many entry techniques you learn, there are only 2 ways to enter a trade. On a pullback. On a breakout. And that’s it. But many of you struggle with this concept. How do I know where a pullback will end? Breakout tends to fail, I hate trading breakouts. Should I wait for confirmation, or not? Because in this post, I’ll teach you the essentials of trading pullbacks and breakouts. 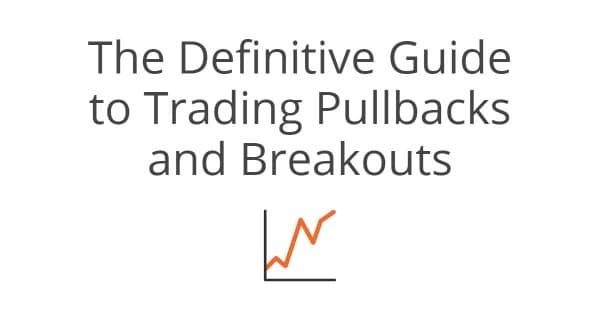 Click here to get my FREE cheat sheet that shows you how to successfully trade pullbacks and breakouts (the cheat-sheet includes an additional technique to increase the probability of your breakout trades). A pullback is when price temporarily moves against the underlying trend. In an uptrend, a pullback would be a move a lower. In a downtrend, a pullback would be a move higher. According to the works of Adam Grimes, trading pullbacks have a statistical edge in the markets as proven here. What are the pros and cons of trading pullbacks? You get a good trade location as you’re buying into an area of value. This gives you a better risk to reward profile. You may potentially miss a move if the price doesn’t come into your identified area. You’ll be trading against the underlying momentum. Now, this brings you to the next question. Where does the pullback end? You can’t predict with 100% accuracy where pullbacks will end. You have an idea where price could potentially retrace to. Do you wait for confirmation? A confirmation is when a candle closes in your direction, confirming your initial trading bias. This increases the probability of your trades. While waiting for confirmation, you get a poorer risk to reward. Because you’re entering your trades after the price has moved in your favor. There’s no right or wrong answer here, but rather what suits you best. Whichever choice you make, you must know the possibility and consequence that comes with it. How do you develop a system to trade pullbacks? Disclaimer: Below is a random trading plan I’ve created to illustrate my point. If 200 EMA is pointing higher and the price is above it, then the trend is bullish (Condition). If the trend is bullish, then wait for the price to pullback to an area of support (Condition). If price pullback towards your area of support, then wait for a higher close (Condition). If price closes higher, then enter long at next candle open (Entry). If you are long, then place your stop loss below the low of the candle, and take profit at swing high (Exit). Vice versa for a short setup. By using the IF-THEN syntax, it keeps your trading more objective with lesser room for discretion. How do you find high probability pullback trades? If you want to find high probability trades, you need to look at something called confluence. A confluence is when 2 or more trading tools come together to give the same trading signal. Alternatively, go read Moving Average 101, by Steve Burns, to learn how to incorporate moving average into your trading system. It does not make sense to only wait for high probability setups because you may end up with very little trades. Likewise, you don’t want to be taking trades all the time just because a single indicator gave a buy/sell signal. If you want more explanation, read How To Trade Like A Pro: Take Mediocre Setups by Tradeciety. My suggestion is to have a confluence between 2 to 4 factors. You’d probably realize there’s an endless combination you can come up with. To find out whether it can be consistently profitable, you’d have to test it yourself. A breakout is when price moves outside of a defined boundary. The boundary can be defined using classical support & resistance. What are the pros and cons of trading breakouts? You will always capture the move. You are trading with the underlying momentum. You get a poor trade location as you’re paying a premium. You may encounter a lot of false breakouts. Despite the possibility of false breakouts, it should not deter you from trading it. Because the best traders in the world love trading breakouts. How do you identify a potential breakout before it happens? For breakout trades, a confirmation would be a candle close beyond the highs/lows you’ve identified. You may potentially end up missing a huge chunk of the move. This depends entirely on your trading personality. There’s no hard and fixed rule about it. If you’re someone who prefers a candle close, then wait for a confirmation. If you’re someone who prefers a better risk to reward, then trade without confirmation. But bear in mind both have their pros and cons, and it’s something you have to accept. How to develop a system to trade breakouts? If the price has been in a range for the last six months, then place a buy stop order at the high of the range (Condition). If a trade is triggered, then place a stop loss at the low of the previous candle (Entry and exit). If the price goes in your favor, then look to trail your profits at the low of the previous candle (Exit). Vice versa for short setup. The market tends to move in a cycle. From a ranging period to a trending period, and vice versa. The longer it’s in a range, the bigger it’ll trend later on. If you notice the price has been ranging for a long time, you’re not alone. Traders all around the world will be seeing the same charts as you. Some will be queuing to short the resistance, and some will be trading the breakout. If the price does trade above the resistance, shorts will get squeezed, and breakout traders will hop on the bandwagon. This is why price is sustained for period of time, due to the imbalance of buying/selling pressure. You’ve just learned how to successfully trade pullbacks and breakouts. Click on the link below and enter your email to get access to my FREE cheat-sheet on trading pullbacks and breakouts. This cheat-sheet has all the techniques that were taught here…and an extra one, which I didn’t have room to include in this post. Wow, this article was very well written! I am a trend follower, and like you, I also only trade pullbacks and also breakouts. I really appreciate the time and effort you took to put all these info into an article like this. Thanks! Hope you don’t mind me adding a little of what I picked up from other traders. A famous trader, Raghee Horner(can easily google her) wrote a book called “The million Dollar setup” in which basically she uses the 34ema plotted separately at high, low and close to check the strength of the trend. If an uptrend has the 34ema lines pointed sharply at an angle between 12 to 2 o’ clock like on the face of a clock, then the trend is strong. If in a downtrend the 34ema lines are pointed at an angle between 4 to 6 o’ clock, then the trend is strong. I personally use a variant of this system, not the 34ema, but the 20sma to point out to me if the trend is strong and worth trading. Anyway, my point is that for traders trading a pullback, the slope/angle of moving average lines can be a good indicator of the strength of the trend. As for how I trade breakouts, it would be largely similar to what you mentioned above, with the addition of adding bollinger bands to let me know if price might be breaking out. When the bollinger bands squeeze together and become very narrow, then price closes strongly above or below with the upper and lower bands pointed in opposite directions and expanding, then it would be a good time to enter in the direction of the breakout. Lastly I do look forward to reading articles like these that you take the time and effort to write, because sometimes they remind me of what I already know, and also many times you point out something that I would never have thought of and which gives another perspective of how to trade a trend. Hope you keep them coming! Thank you for reaching out. I’m really glad to know you found this article useful. I’ve heard the works of Raghee but I’ve never look at it myself. It’s about time I read her teachings. Yes looking at the slop of the moving average is a good way to define the strength of a trend. Because a mistake many traders make is to treat all trends the same when that’s clearly not the way. Some trends are stronger and some are weaker. I’m really glad to know a veteran trader like yourself still find something useful here. Keep it one, thanks for this effort to write this article. Reminds me 5 years back things that I already known, but already forgotten now. Sometimes traders focus on the complex stuff when all you need is to, ‘KISS’. The principles are the same for all time frames. I randomly selected the charts that could illustrate my point. Great lesson – Thank you, I am busy putting my trading plan / rules together, stictly trading Pull Backs, Break Outs and Swings when the market is trending and the range when the market is in a Trading Range, exclusively with the trend – Your articles and videos have been a grear help in getting me to this point, I am really grateful for your time and effort! Yes developing your trading plan is key. And once you’ve nailed that down, execute your trades consistently for the law of large number to play out. Keep me updated on your progress. I hope to hear much more from you. I don’t have what to say.. this article should be at the “Hall of Fame” of your blog, it’s really an amazing, amazing post, amazing work, many thanks for your time! I need a little clarification where to place SL in breakout trade, and when and how to trail it. The link (cheat-sheet) in the end of the post is broken, it’s take me again to this post. Thank you for your comments, that really made my day! You can use 2ATR for your breakout trades, and trail using a moving average, or take profits at the nearest SR. That’s up to you. OK. But you wrote to put the SL in low of the candle before the breakeout, and then how trail it.. and I don’t understand this way.. if you could explain me it again please.. Sorry for bother you Rayner. Not at all Shlomi, cheers! There are few ways to place your initial stoploss. Trailing stoploss is a different thing here. You typically want to trail so you can ride the trend, should it continues in your direction. Using moving average is one approach. You can consider using the 20 or 50 MA to trail your stoploss. So.. there isn’t any golden rule for SL, it’s more dependent on the situation for every trade separately. Which kind of MA is recommended, MA or EMA, and which one for 100 and 200? Again, full thanks for your help! I use 20 & 50 ema for my trading. My account is not that big, so losing almost half of it give me stress. so I decided to pause for a while and analyze whats wrong… A friend of mine told me to read your blog… As I’ve start reading your story, I become interested on it.. So I continue reading the rest of the blog (nearly half of it) . Then I analyze and understand what is happening…. Now, that I have a knowledge (not that much) on what it is all about my trading is getting better. Because it is easy to understand and everything is based on your experience and observation. It is a big help for me…. Thank you for sharing your experience. I’m glad you found this website useful. thank you so much… as of now i’m gaining.. still I little bit scared but i trust what i’ve from you and most of all I trust my self that I can do this. thanks again for your advice and knowledge. I’ll look into your suggestions and see what I can do. Thanks for explaining the concepts with the examples. Your clear explanation help me shorten my learning curve. Although English is not my first language, I find your explanation easy for me to understand . Thx so much Rayner , by efforth and share knowledge clear explenation …….greeting . God blest to you and family ……….! – Enter the trade before confirmation, but with a wide stop loss (probably at previous swing high/low). Please tell me what you think. Again thanks a lot Rayner. The best breakouts are those that form buildup at SR areas. Rayner, you are a blessing to people like me,you have brought a great deal of trading improvement to my trading,your simplicity to you explanations is overwhelming. God Almighty bless you with long life. Awesome to hear that, Albert! And what do you expect me to do? I have tried to download the cheatsheet but the confirmation email is redirecting me to a link of an image, probably the link is incorrect? No worries about it. Just drop me an email and I’ll send it over. Thank you so much for your free material. I foundn in it very very important lessons. I will study it . Thank you for your precious reference. I will study it hard this week. thanks for the help thus far. i am a certified student of yours. do u give out signals? Hey Rayner Please Make a Video Advance Trade using 50 & 200 EMA Candle Breakout & How Do use Both EMA’s Chart Pattern Like a Pro.